L.1. The Proviso for the Steelyard. L. 2. The Proviso for the Steelyard. 3. The Bill to repeal the Act of Parliament, that the King may revoke Acts of Parliament. - Jud'm. L. 2. The Petition to repeal an Act of Parliament,and Award, for the Benefit of Leonarde Dacre. L. 3. For the Stablishment of the Deanry of Wells. - Jud'm. 2. That married Men may be Priests, and have Benefices. 3. 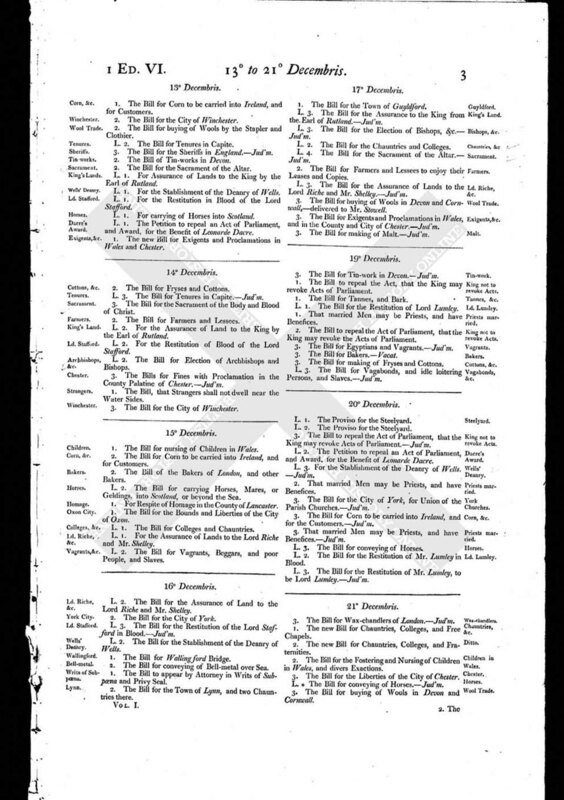 The Bill for the City of York, for Union of the Parish Churches. - Jud'm. 3. That married Men may be Priests, and have Benefices. - Jud'm. L. 3. The Bill for conveying of Horses. L. 2. The Bill for the Restitution of Mr. Lumley in Blood. L. 3. The Bill for the Restitution of Mr. Lumley, to be Lord Lumley. - Jud'm.